Suitable for mono basin mixers, the Villeroy and Boch Cult and Subway basin mixers are created for maximum impact on the bathroom or cloakroom space. Sporting a simple right angle as their design basis, these taps also come with similarly styled bidet mixers for easy compatibility of style and cohesion throughout the bathroom suite or property. For a true taste of continental style cool, the wall mounted mixer set is a prime example. Readily paired with surface mounted basins, they are a simple yet effective method of adding a new twist to the bathroom or cloakroom area. Water flow is controlled via a single lever, intuitively bringing the operation of the outlet to your finger tips. Options for integrated waste control units on a number of these models add another degree of versatility and convenience, with the lever valves discretely hidden at the rear of the unit. Each of these taps is a designer piece in its own right, made to the most exacting of standards to last for years. Looking to purchase new taps and mixers? Perhaps you are in the process of refitting your bathroom and looking for something in keeping with your new suite. Or maybe you are simply looking to replace tired fittings with new fixtures to bring it firmly into the 21st century? Villeroy & Boch, the famous French and Luxembourg-based ceramics brand established in 1748, is quite simply synonymous with quality. Let us guide you through the ranges on offer from the experts at UK Bathrooms so you can be sure you are getting the right fittings for the bathroom you will want to treasure. 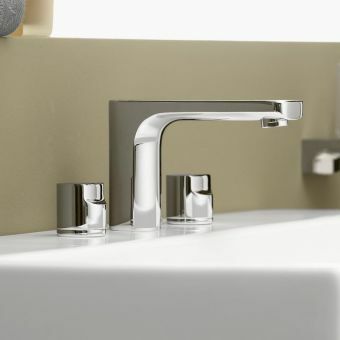 Millions of bathrooms around the world have basin mixer taps installed. They can be a stylish addition to your sink while allowing you to vary both the water temperature and the flow at the movement of a handle. A classic chrome mixer tap can really help to set off a more modern bathroom design with its pure shapes and reflective surfaces. 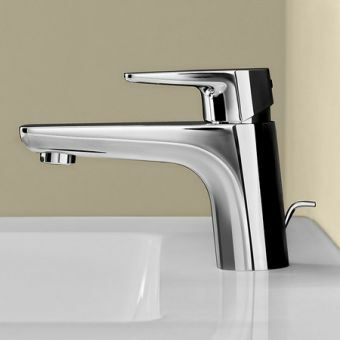 If you are looking for a style which will complement straight edges and elegant curves alike, take a look at the Villeroy & Boch SOHO (Subway) single lever basin mixer. The clean lines and smooth shapes of Villeroy & Boch brassware may seem at odds with a centuries-old company, but here is a brand with a real history of innovation. Over 267 years, Villeroy & Boch has taken chances to reinvent itself time and time again, leading to a culture of decisiveness and forward-thinking design. Whatever their aims have been in the past and are today - creating ultra-hygienic ceramic materials, increasing product functionality, or finding new ways to manufacture world-leading products more sustainably - they aspire to create the best. Their vision is the ultimate user-friendly, aesthetically pleasing product which makes everyday life better, putting sustainability at the heart of their work. Whatever your taste, there's a Villeroy & Boch fitting to complete your perfect bathroom, enhancing the look and feel of your home. Perhaps you have a special style in mind? Whatever your aspirations, Villeroy & Boch offer everything you need for your dream retreat. Clean and modern, timeless and elegant, or curvaceous and romantic, you will fall for the range of collections Villeroy & Boch offer. Beautiful form meets function as the chrome-ware is designed to set off the look of any bathroom suite, as well as being long-wearing and sustainably made. It isn't always all that easy to find the right fittings for your bathroom, choosing from the countless brands and styles on offer. Do you choose one that corresponds to the make of your ceramic ware, and how do you know what will be easy to install? Here, we will discuss the range on offer from Villeroy & Boch at UK Bathrooms, so you are ready to make the right purchase for your bathroom and unique style. Villeroy & Boch's commitment to best practice design runs deep. On a number of Villeroy & Boch basin mixer models, you can opt for integrated waste control, increasing the degree of convenience and versatility, with the lever valves concealed discretely behind the base of the mixer unit. You can be assured of their quality and durability: each tap or mixer is a designer piece in its own right, made to Villeroy & Boch's exacting standards to last for years to come. Villeroy & Boch's Subway, SOHO (Subway) and Cult tap and mixer ranges are designed to fit perfectly in sync with their Subway, Subway 2.0 and Cult ceramic ware collections, but can also be used to add a chic look to any bathroom or water closet suite to achieve the style you desire. Embrace a strong, contemporary look with Villeroy & Boch's Cult range of mixers and taps which can come in classic, glossy chrome as standard or understated matte white as a special order. 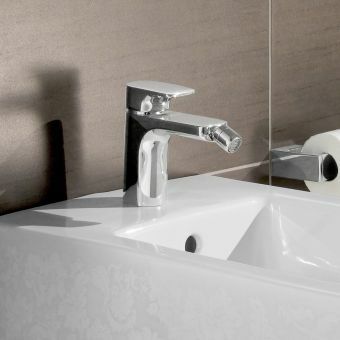 Suitable for mono basin mixers, the Villeroy & Boch basin mixers have been designed with maximum impact on any bathroom or cloakroom space in mind. Built around a simple right angle as the basis for their design, you can match these taps to the range's bidet mixer to create an effortless flow of style and continuity throughout your bathing space or home. Implement a modern, easy continental style to your home with the Villeroy & Boch Cult wall mounted mixer set, for example. Slim straight lines meet effortless functionality as the set is ready to be paired with any surface mounted basin, adding a twist to any bathroom or cloakroom space. Simply flip the single lever for intuitive operation. What's more, there's something to suit any style of basin in the Cult range. Choose from a traditional, low lever mixer tap - again benefitting from simple one-touch operation - to a stylish high mixer tap designed to fit even the chunkiest of free-standing basins. Or, if you like the look of a single tap with hot and cold temperature control either side, opt for the Villeroy & Boch Cult three-hole basin mixer tap - something a little different for your dream sink space. Another sterling example of the contemporary, European style Cult look is the complementary bidet mixer. Bearing the same crafted, right-angled arrangement, the bidet mixer is compatible with standard, single hole bidets. It also comes with an integrated pop-up waste included in the set, giving the user a swift and hygienic way of dispelling waste water. Using the same ceramic disc technology as the rest of Villeroy & Boch's mixer range to regulate water flow, its seven litres per minute make it suitable for use with high-pressure plumbing. Long gone are the days where taps were seen purely as functional and only came in a handful of styles. Make the perfect unostentatious aesthetic statement with Villeroy & Boch's Subway range with its clean lines and unobtrusive curved edges. The quintessential piece from the range is the sleek SOHO (Subway) classic basin mixer, designed to perfectly complement the rest of the range's straight edges and curved corners. Featuring a classic lever to vary the water flow vertically and the temperature horizontally, you are in control with just one touch. It's always nice to be presented with options. Choose between the tap with or without a 1 1/4" pop-up waste disposal function to suit your needs. If you select to just purchase the tap without the pop-up, be aware that you will need an alternative such as a separate push button or flip waste. You do not have to worry - we're on hand to help you decide and can offer suggestions. Just ask us by phone or email. 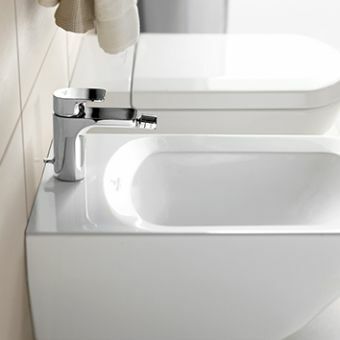 For something truly first class, look to the wall mounted taps from the Villeroy & Boch Subway range. In keeping with the rest of the range's clean and simple aesthetic, use them to create an alternative approach to arranging the wash area. Forming a set with two separate components, the spout and level can be arranged any way you wish. An easy grip, right angled form means that the mixer valve is intuitive and simple to control. The spout has a projection of 190mm, giving it the perfect reach to coordinate with most free standing, surface mounted basins. Able to handle a maximum flow rate of seven litres per minute, it comes fitted with half-inch connectors for compatibility with most plumbing. Looking for the perfect bathroom fittings for a bath ready to relax in? 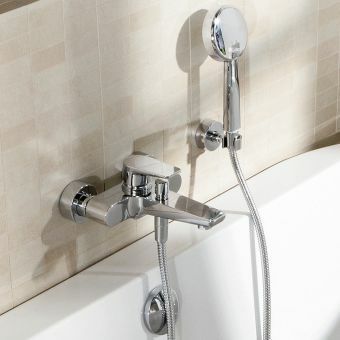 Try the Villeroy & Boch Subway single lever bath mixer tap. Designed to fit seamlessly into the aesthetic of the rest of the range in any contemporary, urban interior, the wall mounted bath spout encapsulates the trend for strong, minimalist pieces. Suitable for use with the majority of bath tubs, it has a water projection of 190mm and is built to be fitted flush against the wall. It comes complete with half inch connectors, a plug link mounting and an M 24 x1 male thread aerator, allowing for quick and painless installation. There are also plenty of options to pair it with diverter valves for use with shower outlets. What makes a Villeroy & Boch tap or mixer different from any other? They're one of the leading ceramic ware brands in the world with a long history of astonishing innovation and a reputation for durable, sustainable, forward-thinking design. The Subway, Subway (SOHO) and Cult ranges exemplify the aims of the brand with their simple, sleek lines in polished chrome creating understated features in any style of bathroom or water closet. Think European, modern shapes crafted to fit the ultimate contemporary urban interior in mind. Choose to buy true design pieces you will love to use for years to come. And choose to buy from UK Bathrooms. We're on hand to help you find the right taps, mixers, fittings and fixtures to truly enhance the look of your bathroom or cloakroom space. Let us help you create a space you will really want to spend time in.